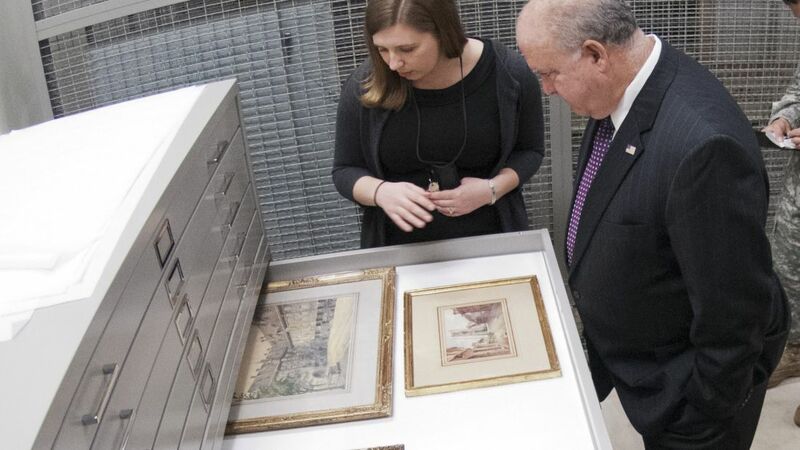 Art Curator Sarah Forgey shows Under Secretary of the Army Joseph W. Westphal four watercolors by Adolf Hitler at Fort Belvoir, Virginia. During World War II, the U.S. military launched a full-scale effort to find and save pieces of European art stolen by the Nazis. The Monuments, Fine Arts, and Archives program—better known as the "Monuments Men"—would eventually liberate Rembrandt's Night Watch, parts of Hubert and Jan van Eyck's Ghent Altarpiece, and Botticelli's The Birth of Venus. While a 2014 film by George Clooney helped popularize the organization's efforts, and it was recently announced that a modern version of the "Monuments Men" is being established (and is recruiting), less is known about the group's initiative to seize art made by the Nazis—including works by Adolf Hitler himself. As an artist, Hitler is usually framed as a failure: He was rejected twice by the Academy of Fine Arts Vienna and spent his early twenties making postcards and street art. But he never really let art go. When he later entered politics, he came in with an understanding of art's emotional potential as a propaganda tool. "As its leader, Hitler ordered the creation of a corps of artists to document the country's military exploits," journalist Andrew Beaujon wrote in a fantastic piece for the Washingtonian. "They made field sketches of German troops in action and later turned them into paintings, which were then sold to high-ranking officers and displayed in military-run museums and casinos. Other paintings depicted Hitler as half man, half god, often with medieval overtones." By the height of World War II, German homes and public spaces were awash in these militaristic paintings and sculptures. But American President Franklin D. Roosevelt understood the power of art, too, and in early 1945 he joined Winston Churchill and Joseph Stalin in pledging to, "remove all Nazi and militarist influences from public office and from the cultural and economic life of the German people." As many of the Monuments Men were busy saving works of art stolen by the Nazis, one man—Captain Gordon W. Gilkey, of the military's Office of the Chief Historian—was busy stealing works of art made by the Nazis. As part of the Allied Denazification program, Gilkey and his crew seized nearly 9000 pieces of propagandist artworks considered too controversial for public consumption, including four watercolors painted by Hitler himself. Eventually, this trove would be tucked away under lock and key at the Museum Support Center at Fort Belvoir in Fairfax County, Virginia. While the most inoffensive artworks were repatriated to Germany over the ensuing decades, the U.S. military still possesses nearly 600 of the most flagrant Nazi works of art. Overseen by the Center of Military History, the artworks in Virginia include a painting of Hitler fashioned as a medieval knight (with a bayonet hole through his head), a bust of the Führer (scuffed with American boot marks), and, of course, those four watercolor paintings. In 2020, the U.S Army plans to open the National Museum of the United States Army at Fort Belvoir. Whether the 185,000 square-foot museum will exhibit any of these controversial works—or whether they will remain buried in the shadows of the fort's archives—remains to be seen.